According to the Gottman Institute for Couples Therapy, defensiveness is one of the main predictors of divorce. It’s a common but destructive habit that can be the start of communication problems. 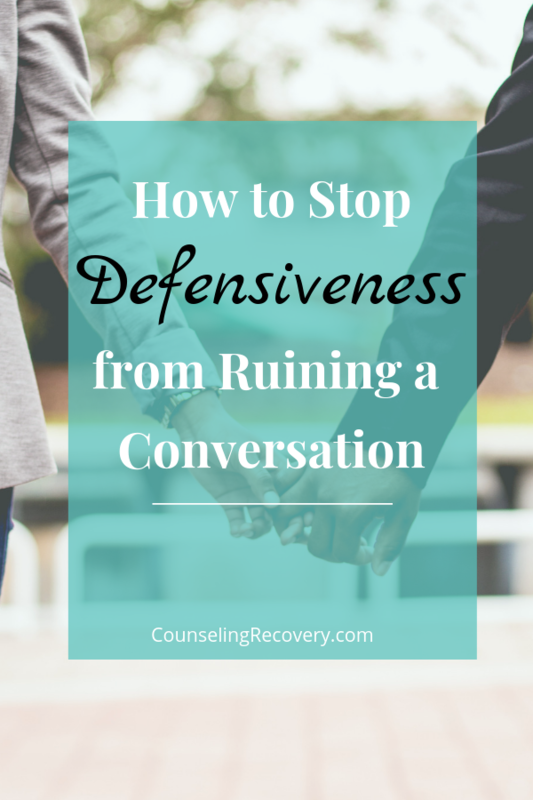 In this blog you’ll learn how to lessen defensive reactions to keep your communication healthy. Because defensiveness triggers a physiological response of stress, it makes communication difficult. People reacting defensively often lose the ability to listen effectively. When you or your partner can't control how each of you react, the ability to talk things out goes downhill fast. Unfortunately, getting defensive happens in seconds, so it’s critical to interrupt the cycle. Your ability to listen and resolve differences will become almost impossible. Once that fight, flight or freeze response takes over, a rational discussion just can’t happen. It’s important to notice what happens in your body as you start getting defensive. There is always an emotional reaction building within us before we react. Paying attention to how you feel helps to prevent these feelings from escalating. For instance, you might notice your heart-rate increasing or feeling tense in the neck and shoulders. Negative thoughts will increase your likelihood of reacting as well. Feeling offended or hurt in some way are common triggers for defensiveness. Once you can identify the feeling, it’s time to do something different. People who react defensively often assume other people are attacking their character in some way. It’s easy to react quickly when you’re on the receiving end of criticism. No one likes to hear something negative about their behavior. In relationships, everyone interprets what they hear based on their own life experiences. For instance, if you witnessed a lot of anger growing up, you might be extra sensitive to any perceived upset around you. In the same way, a certain look or tone of voice can make you want to flee or feel threatened. You may develop a hyper-vigilance in reaction to being around intense emotions. This kind of sensitivity may lead to defensiveness because you think you need to protect yourself. It’s important to note that assumptions are often based on misunderstandings. If you assume the worst, you will have a harder time hearing what’s being said accurately. Giving someone the benefit of the doubt can’t happen when your thoughts are focused on the negative. For more on effective communication click here to read How to Talk So Others Will Listen. Have you ever noticed that you hold your breathe when you’re upset? Feeling stressed makes your breathing restrict because your muscles get tense. You might not even recognize it because it happens so fast. Once you realize that you’re getting defensive, taking a deep breath will help counteract the stress response. Bringing yourself back to the present moment with each breath can be incredibly calming. This takes practice especially by identifying emotions early is the easiest way to prevent them from causing havoc in relationships. Next, assess how much physical space you will need during difficult interactions. This is an important boundary to set for remaining calm. When things are going smoothly, you may not see the need but when a conversation becomes more aggravating, the distance between you and the other person starts to matter. For instance, have you ever noticed how fast an argument escalates when you are in a car? You are trapped with no where to go which makes staying calm more difficult. To keep reactions from getting out of hand, be mindful of where you stand during important discussions. Make sure there is plenty of space to keep everyone safe. A good rule of thumb is that whoever needs the most space gets it. Negotiating this with your partner ahead of time can be a great way to promote mutual trust and respect. For more on boundaries read Everything You Need to Know about Boundaries. Stopping yourself from getting defensive takes effort. When trying to change a behavior, increasing awareness is always the first step. In order for both people to stay calm emotional reactions need to be managed along the way. Being upset is human but taking it out on each other creates a level of contempt that’s hard to repair. Any chance of creating a peaceful resolution starts with you. Join me for weekly relationship tips plus access to my private resource library with my best cheatsheets and videos to help you! Click the image below to sign up now!